Zirakpur is a satellite town of Chandigarh. It is set on the foothills of Shivalik hills. Zirakpur is the 'Wedding capital' of the region. At the confluence of national highway no 21, 22 & 64. Its centrally located and well connected by air, road and railway which makes this a favorite destination for business and transit travelers alike. Each of the 54 guest rooms features an array of modern conveniences. 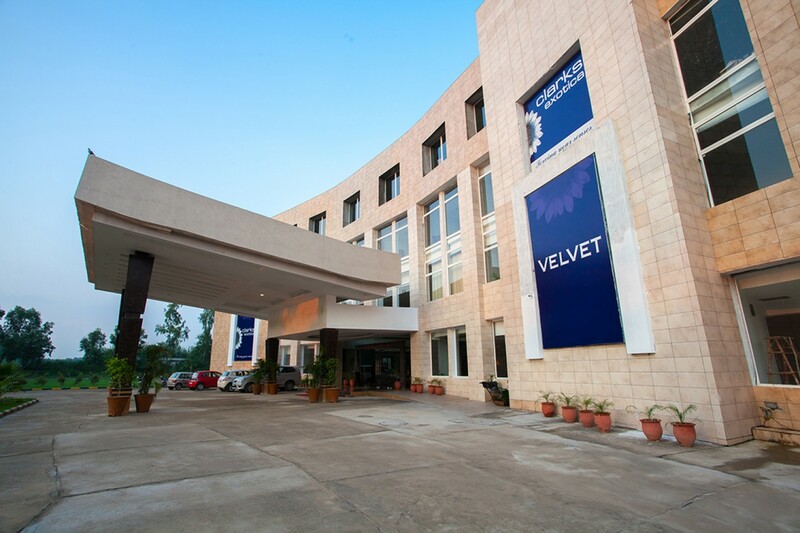 The hotel premises is Wi-Fi enabled with a high speed internet connection to allow the customers to access the internet. We have on-site parking for guests at the hotel to accommodate 1200+ cars. Best Hotel have ever stayed!!!! Really a great experience of staying in this hotel, you talk about Service, cleaning, food or staff, all is just perfect. Special thanks to Reception staff for being so courteous and helpful during the midnight also when i asked for few requests. So will recommend this hotel to all and would definitely visit again and again....!!!! Stayed in this hotel for a week.. The hotel's location was apt for me... It was one of the nearest hotels to the airport you could get.. The hotel was new.. Rooms were very spacious.. The food was tasty.. Really enjoyed the food.. The staff was good but needed further grooming.. They were courteous n provided all the support.. The hotel was coming up with swimming pool n gym.. Had a very good lawn by the side of it.. Enjoyed the stay overall.. Excellent Hotel with Quality Staff!! One of the best hotels we have celebrated our valentine party. Staff were absolutely lovely, everyone I had to deal with were so friendly, polite and helpful. Looking forward to returning over on special occasion . 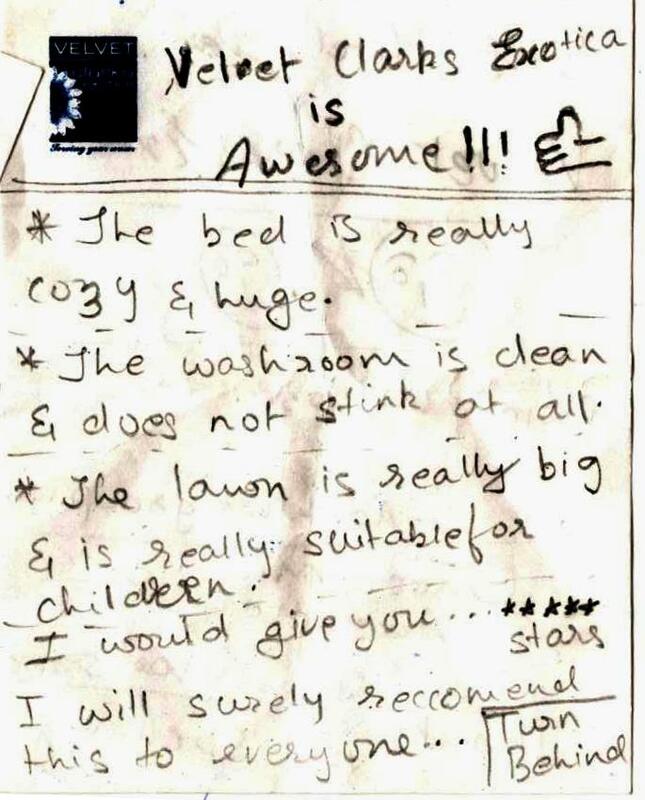 Highly recommended 5 star !!! Really a great experience of staying in this hotel,,,you talk about Service, cleaning, food or staff, all is just perfect....Rooms are spacious and big enough Toilet absolutely clean and fresh Linen provided of good quality Prompt service....Staff were absolutely lovely, everyone I had to deal with were so friendly, polite and helpful.. Excellent property!!! amazing Food!!! Fabulous Hospitality!!! hotel was very nice courteous people inside the hotel but this hotel is not made for family. breakfast was amazing having lots of option,bed was not comfortable rest everything was fine. 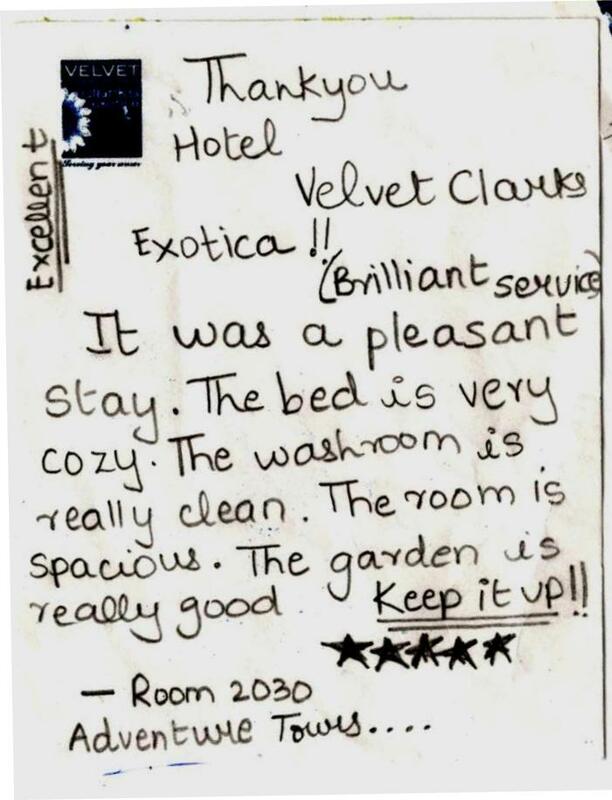 Had a pleasant experience with velvet Clarks Exotica. The service is excellent, and so is the quality. Since they are offering introductory rates as of now, I am bound to say-great quality at very affordable price. Excellent property which is well maintained. Great service and food. Extraordinarily huge rooms and bathrooms...really had a pleasant experience wants to rate this hotel 4.5 on 5. We hired 13 rooms and conference hall for three days annual sales meet with about 35 guests. Overall experience was very satisfying. Food, service, rooms, hall, ambiance and cost every aspect was good. We may plan yet another event there.